The dedication of the new facility of the Allegheny Observatory in Pittsburgh occurred one hundred years ago on 1912 August 28. However, it took many years to reach the day when well-known astronomer and telescope-maker, and Chairman of the Observatory Committee, John Brashear made the address presenting the new Observatory building to the Trustees of the University of Pittsburgh. The original Allegheny Observatory opened with first light in the 13-inch Fitz Refractor Telescope (then, the third largest telescope in the world !) on 1861 November 27. The small observatory building had been built on a hill overlooking the business districts of Allegheny City (annexed to Pittsburgh in 1907 and now Pittsburgh's North Side) and, just across the Allegheny River, Pittsburgh. By the end of the nineteenth century, smoke from Pittsburgh's growing industries made the sky, at the original observatory site, difficult for astronomical research. John Brashear started the long campaign to build a new, larger observatory, further from the industrial smoke. At that time, Allegheny City was converting farmland, a few miles north of the business district, into a large city park, Riverview Park. 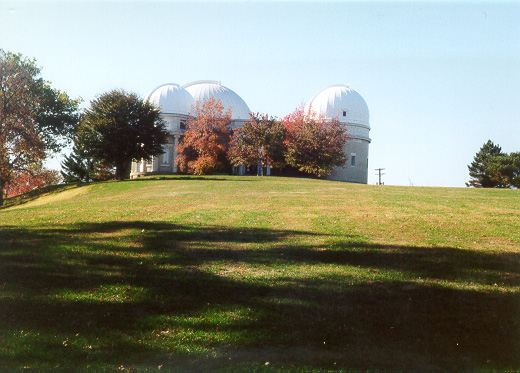 John Brashear received approval to build the new observatory on the highest hill in the new park (second highest site in Western Pennsylvania). When Dr. Brashear's fundraising campaign began the nation was in a recession, caused by the financial panic of 1893. Andrew Carnegie advised him to wait until better financial times saying, "Wait, Brashear, until coke sells at a dollar a ton and we will build the Observatory." So, John Brashear and then-Allegheny Observatory Director James E. Keeler continued making plans and drawings, while waiting for the nation to recover from recession. Further delay occurred in 1898, when Professor Keeler was offered the directorship of the Lick Observatory in California, and then the outbreak of the Spanish-American War. The cornerstone for the new observatory building was finally laid Saturday Afternoon, October 20, 1900. It would take nearly twelve years to finish the three-dome building. In the meantime, John Brashear was very busy with other duties. John Brashear became Acting Director of the Allegheny Observatory, and a little later, Acting Chancellor of the Western University of Pennsylvania (now known as the University of Pittsburgh). Andrew Carnegie also asked him to be a member of the three-person committee to begin planning for what would later become Carnegie Mellon University. In 1899, Andrew Carnegie donated $20,000 for the observatory project, and Charles M. Schwab, the first President of the U.S. Steel Corporation, arranged for all of the steel for the new observatory building to be contributed by the now-U.S, Steel-owned Carnegie Steel Company. George Westinghouse, who shunned publicity, quietly donated the entire electrical installation for the observatory. However, by 1905, it became clear that Dr. Brashear still did not have enough funds to complete the observatory. While attending a private dinner with industrialist Henry Clay Frick, Mr. Frick told Dr. Brashear, "Brashear, go and find out what it will cost to finish the building and equipment and I will give you half the amount if you will raise the balance by October 15th." $65,000 was still needed to raise the nearly $300,000 for the complete project. Due to his wife's failing health, Dr. Brashear was committed to their annual visit to their summer home in Muskoka Lakes, Canada. It was from there that Dr. Brashear, through long-distance correspondence, raised $20,000 for the project. The remaining $12,500, with a few thousand dollars extra, was raised, by Mr. Frick's deadline, after Dr. Brashear returned to Pittsburgh. With the Astronomical and Astrophysical Society of America holding their annual conference in Pittsburgh in August of 1912, it was decided to hold the dedication of the Allegheny Observatory on Wednesday Afternoon, August 28. Previously, research observatories would, from time-to-time, allow the public to tour the facility and look through the research telescopes, particularly during special astronomical events such as a bright comet or a lunar eclipse. The idea of a "public observatory" did not begin to be somewhat common until the 1930s, with the advent of astronomical observatories built in conjunction with other public education facilities such as planetaria and science museums. Observatories built in conjunction with Philadelphia's Franklin Institute/Fels Planetarium (1933), Los Angeles' Griffith Observatory and Planetarium (1935), and Pittsburgh's Buhl Planetarium and Institute of Popular Science (1941) were the earliest such public observatories. In his autobiography, John Brashear writes, "In my early struggles to gain a knowledge of the stars, I made a resolution that if ever an opportunity offered or I could make such an opportunity, I should have a place where all the people who loved the stars could enjoy them;...and the dear old thirteen-inch telescope, by the use of which so many discoveries were made, is also given up to the use of the citizens of Pittsburgh, or, for that matter, citizens of the world." With the new Allegheny Observatory containing two new, large research telescopes, there no longer was a major research purpose for the original, smaller telescope, or for that matter, for the construction of a third telescope dome. However, Dr. Brashear felt so strongly that a telescope should be reserved for public use, he made sure that the original 13-inch telescope was mounted in a third dome designed for public use. Hence, the 1912 Allegheny Observatory building may truly be considered the first "public observatory," constructed in conjunction with a two-dome research observatory! At John Brashear's insistence, the building also included a public lecture hall. Dr. Brashear took many steps to insure that the public would benefit from the new observatory. Henry Clay Frick agreed to subsidize free-to-the-public, evening tours of the Observatory several nights a week. John Brashear hosted hundreds of members of the public for telescope viewings, in the partially-completed observatory and on the observatory grounds, for viewings of Halley's Comet in 1910. And, the observatory was located just one block from a major city streetcar line. Hence, today, with the large Thaw Refractor Telescope, the Allegheny Observatory is the largest astronomical observatory within the city limits of a major American city! The building was built with a compact, three-level (includes two balconies) astronomy library, which is part of the university's library system. Just outside of the library, in the center of the building's marble-lined rotunda, a bronze statue of John Brashear watches over his creation. Urania, the muse of astronomy, displayed in a stained-glass window, keeps Dr. Brashear company. Also adjacent to the rotunda is the Clock Room, which houses the Observatory's official clock. In the basement is stored the large collection of photographic plates, from decades of telescope observations. These observations have made the Allegheny Observatory a world leader in astrometry, helping determine the precise distances to many stars. "We have loved the stars too fondly to be fearful of the night." Pittsburgh's Allegheny Observatory: New History Film:. I grew up visiting Buhl Planetarium and went to John A. Brashear High School and never knew any of this! Thank you for publishing this. I can't believe I new nothing about this. My failure to look into such distinguished men's beginnings has now been extinguished. Thank you again.